Only 1.3 percent of the country’s adult population, which translates to around 900,000 Filipino adults, have an electronic money (e-money) account, according to the Bangko Sentral ng Pilipinas (BSP). In its 2017 Financial Inclusion Survey, the BSP defines e-money accounts as “a transactional account such as an e-money wallet or card provided by E-Money Issuers (EMIs).” The report further revealed that majority of e-money account holders are in the Visayas, and that there were more adults belonging to income class E that have an e-money account than the four higher income classes combined. While e-money penetration remains low, the BSP noted that awareness of e-money platforms, particularly those that offer digital payments services, are much higher. Smart Money and PayMaya, two mobile payment services offered by telecommunications firm PLDT Inc., ranked highest among digital payment methods in terms of customer awareness, with 36 percent of respondents saying they were aware of either service. 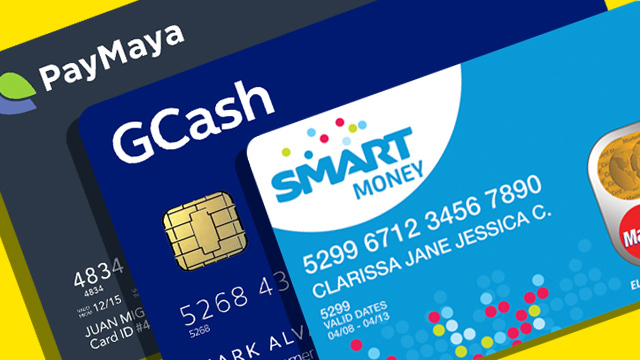 Smart Money claims to be “the world’s first e-wallet linked to a mobile phone,” while PayMaya uses both a mobile app and cash card to provide digital payment services. GCash, from rival telco Globe Telecom, is a close second at 33 percent. Through its mobile app and cash card, GCash allows its users to transfer money, pay bills and pay for services without the need for physical cash. It is supported by Ant Financial, the financial services arm of Chinese e-commerce firm Alibaba. The dominance of PLDT’s Smart Money and PayMaya and Globe’s GCash in terms of consumer awareness mirrors the leading role that the two telcos also play in the telecommunications sector. They are the only landline and mobile phone service providers, and dominate the fixed and wireless broadband business. Both PayMaya and GCash have made aggressive pushes over the past year to make their mobile money services available across different verticals, which may account for its high awareness in the BSP survey. In 2017, both companies partnered with multinational tech giants Facebook and PayPal to integrate their services into Messenger and PayPal’s respective platforms. The Financial Inclusion Survey listed four other e-payment providers, but awareness of these players was much lower than PayMaya or GCash. Coming in third was local multi-channel payments provider PayEasy, with six percent of respondents being aware of the platform. US-based payments platform PayPal followed closely behind, with five percent saying that they knew about the company. Completing the list are two local firms: Coins.ph, a mobile wallet that also functions as a Bitcoin exchange; and Dragonpay, a payment gateway enabling establishments to accept different types of payments. Both platforms saw two percent of respondents being aware of their respective brands. The BSP highlighted that awareness of these digital payment methods was “particularly high among the upper class and in the Metro Manila area.” On the other hand, awareness was below average in the Visayas and Mindanao regions, among those belonging to income class E, and among respondents aged 50 and above. Whether or not this high awareness can translate to higher usage and adoption remains to be seen. But the BSP’s heightened focus on these fintech platforms in the survey highlights that these players remain a crucial part in the central bank’s mission to digitize 20 percent of all transactions in the country by 2020.